If you are a crafter or DIY enthusiast, you know that using the right tools for your projects can make them a whole lot easier and fun. When it comes to sculpting, there are quite a few tools out there that people use. If you are relatively new to sculpting, you may not be sure where to start when searching for the best sculpting tools for your DIY project. There are many ways to sculpt and it will mostly depend on what type of project you are doing and what tools you like the most so be sure to try a few out and experiment a little to find what you need. Stick tools – These tend to be used for adding material to what your are sculpting. Loop tools – These will usually be used to take away material from what you sculpt. DIY Clay Sculpting Loop Tool – You can make a loop sculpting tool using easy to find materials such as: Brass or aluminum tubing, piano wire, bass guitar strings, epoxy resin, wire wool or dish-scouring pad, pliers and a small adjustable pipe cutter or craft knife/ blade. 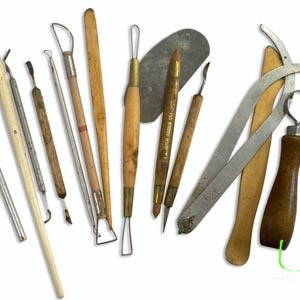 Various Sculpting Tools – You can make various sculpting tools out of pins, needles, clay, knives, brushes, pencils, toothbrushes, nail tools, etc. The possibilities are seemingly endless! Items around your house can be made useful for carving or printing patterns into the clay so look around and see what useful items you can find that you already own. Armature Board – Generally used for mounting your sculpture and securing it so that you can work on it in more detail without having to hold onto it while you work. Stainless Steel and Wood Modeling Tools – For adding material and shaping your sculpture. Aluminum Loop Tool – For shaping your sculpture and putting patterns and detail into it. Copper Wire – For making a model figure or shape to work your wax or clay around. Smoother – To smooth out the surface of your sculpture or figure.